Band of Brothers continues to play on various stations after Rememberance Day last week. We are still regularly watching it, despite having already seen it every other time there has been a marathon, or we’ve decided to watch it on Netflix. It’s just that damn good. Or rather, it’s just that damn honest about a group of incredible men whom we’ve come to respect and would be so honoured to meet. Band of Brothers is a series put together by Tom Hanks and Stephen Spielberg that bares many similarities to their Saving Private Ryan, however the series is the true story of the 101st Airborne - Easy Company - and their struggles, triumphs, losses, blood and tears, from start to finish. Every episode begins and ends with interviews from the real men of Easy Company. These brief moments when they bare their souls are the most heart wrenching moments of the show. An accompanying documentary also exists, expanding on these interviews, allowing them to speak more – or less – about the moments that have defined their lives. They describe events in the documentary that the series manages to perfectly capture, for better or worse. Every time we watch Band of Brothers, we are awed by the actors themselves. There are a lot of recognizable names and faces that make Six Degrees of Kevin Bacon too easy to play, but, in even the smallest role, they all seem to give their 101% to bring these men and these moments to life. Hanks and Spielberg tried to recapture this magic with Pacific, but, perhaps they tried too hard. Pacific attempted to focus on specific soldiers and their personal lives, but half way through, we couldn’t remember names or tell them apart and we soon lost interest. 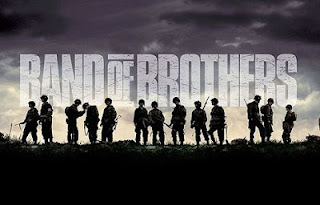 Band of Brothers tells the story of specific men through the many battles they fought, both personal and on the battefield. I love war movies, but I hate the ones that go too deeply into the "FY America" aspect of it. yes, these are American soldiers, but after a while, we forget that. They could be anybody. They are soldiers. Men. Brothers. "No... but I served in a company of heroes".